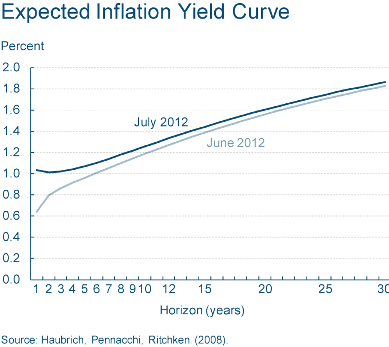 Navigation: Home » Economics » What Sort of Inflation Expectations Does the Market Have? What Sort of Inflation Expectations Does the Market Have? One important thing to have an idea of – for personal and business reasons – is the amount of inflation expected in the future. Think about it – by having a reasonable number to plan for the erosion of the value of your money, you will better be able to make decisions on what loans to take out, what purchases to make, and how to invest. Luckily for you, there are a few ways to gauge these predictions, which don’t resort to guessing, praying, or going to a fortune teller. The methods are also more sophisticated than taking the last few years worth of data, drawing a trend line, and attempting to extrapolate future results. The Federal Reserve Bank of Cleveland publishes the results of their model on inflation , which uses inflation swap trades to try to adjust for the shortcomings of our second method. They currently predict (July, 2012) 1.26% inflation over the next 10 years, 1.60% inflation over the next 20 and 1.86% inflation over the next 30. Not bad, historically. Of note, the Federal Reserve has stated they want to keep inflation around 2% long term. Ask Cameron more about that number and why it’s likely the target (I can’t do it justice). So now you’ve been forewarned – the market is only expecting inflation in the sub 3% range over the next 30 years. Pretty impressive how we can figure that out without picking up a phone and polling people, isn’t it? It also make the extremely low price on debt – like mortgages in the 3%s – seem like even better buys. What do you think about expected inflation rates? Will you be taking advantage of cheap money in the form of debt? Isn’t the difference between inflation expectations and mortgage rates incredible? I heard that food prices are expected to rise by 4.5% next year due to the current drought. I wonder if commodities might be a good play or has that already been priced into contracts? I think this is one of those “once we know about it – it’s already priced in” things which are waaaay to common in investing. That’s one reason I prefer value stock – everyone knows the numbers, but by reading them in a different way I can guess which stocks have fuel in their tanks – versus futures/options! That is a pretty good way to predict inflation! I’ll have to remember that. So we’re still looking at 3% again …. The Fed is targeting 2% for the as-yet-forseeable future, so expectations aren’t too far off the mark. Of course, remember they are just expectations – we could have all sorts of weirdness over the next 30 years, from deflation to hyperinflation. I just wouldn’t bet on it, haha.